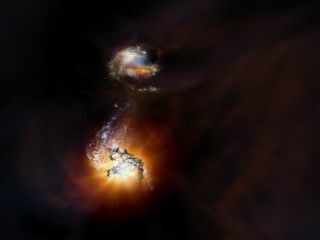 An artist's impression of two starbursting galaxies beginning to merge in the early universe. Imagine what the iconic pillars of the Eagle Nebula would look like if a powerful force caused the stellar nursery to create stars at a thousand times its current rate. New observations confirm that a bright point of light in the constellation Dorado is in fact an intense, extraordinarily bright region of star birth. It was formed by the repetitive collision of two spiral galaxies so far away that their light comes from the early universe. Dominik Riechers, an astronomer at Cornell University in Ithaca, New York, and lead author on the new study, observed the colliding starburst galaxies with his team using the Atacama Large Millimeter/submillimeter Array (ALMA) in northern Chile. The galaxies are similar in structure to Earth's home, the Milky Way galaxy, which also hosts the star-forming Eagle Nebula.. The new findings suggest that the brightness of the two starburst galaxies isn't merely a result of their collision. The two spiral structures located 12.7 billion light-years away from Earth, known collectively as the ADFS-27 system, also have more star-making material to work with than Earth's home galaxy does. In fact, ADFS-27 has "50 times the amount of star-forming gas as the Milky Way," researchers said in a statement from ALMA. This is a composite image of the ADFS-27 system, which shows how the galaxy pair appeared to researchers over the course of several observations. The large background image was taken by the European Space Agency's Herschel Space Observatory, and the object was then detected by the European Space Observatory's Atacama Pathfinder Experiment (APEX) telescope, shown in the middle image. The Atacama Large Millimeter/submillimeter Array (ALMA) was able to identify two galaxies, seen in the image on the right: ADFS-27N (for north) and ADFS-27S (for south). Starburst galaxies are relatively rare, and the research team said they were astounded to find two of the massive galaxies near each other. These observations are also a dramatic look into the past: Because the starburst galaxies are so far away, astronomers are actually observing them as they appeared when the universe was only 1 billion years old. At that time, the universe was just becoming transparent, as the process of reionization finished. "Considering their extreme distance from Earth and the frenetic star-forming activity inside each, it's possible we may be witnessing the most intense galaxy merger known to date," Riechers said in the statement. Their predicted course is to ultimately merge into one large elliptical galaxy. And because distance creates a long lag time between when events in those galaxies occur and when we can observe them here, that massive merger may have already occurred.